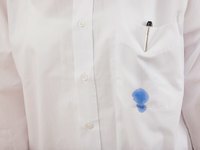 Ink stains on the breast pocket of a dress shirt are a common occurrence caused by placing a leaking pen inside the pocket. It may look like a favorite dress shirt is ruined. However, there are some time-tested, first-aid stain removal techniques that can get ink stains out and a shirt clean. Fill a small bowl with cool water. Dip the stained pocket into the water, and place on a flat surface covered with an old towel. Cover the stain with rubbing alcohol or hairspray; be sure that it is completely soaked with the alcohol. Dip the wet, alcohol-soaked pocket back into the bowl of water. Squeeze gently and repeat the alcohol dousing and water soaking until the stain has begun to fade. Replace the water in the bowl with clean water if it starts to take on a colored tinge. Wring the pocket gently so that it is not sopping wet, apply a dab of glycerin directly onto the remaining stain. Use your finger to rub the glycerin into the fabric. Fill the bowl with clean cool water and a few drops of gentle laundry detergent. Agitate the water in the bowl with your hand to make suds. Place the shirt pocket into the bowl of water and detergent. Rub the shirt fabric with your fingers to lather around the stain. Repeat the glycerin application and gentle detergent lathering until the stain has released and the fabric looks clean. Launder the shirt as usual. Glycerin is usually available at local drugstores. Use color-safe bleach in the wash to help brighten the shirt after stain removal. Do not use hot water or dry the shirt until the stain is removed. Heat will set the stain.